Set in the bustling heart of Calangute, Casa de Goa is a popular choice for holidaymakers, and for good reason. The sought-after location in the heart of Calangute. There's a small road separating the suites and villas from the main hotel. 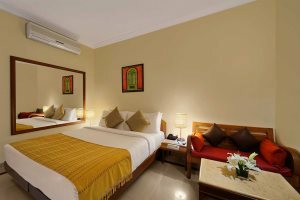 A friendly, family-run hotel just a five-minute stroll from the golden sands of Calangute Beach, Casa de Goa is a great choice for couples hoping to enjoy many of North Goa’s highlights. Taking its influence from Goa’s Portuguese heritage, the property itself is presented as a beautiful colonial mansion, using traditional colours along with terracotta tiles and white window and door accents. The guest rooms at Casa de Goa utilise dark wood furniture, perfectly complementing the fresh, neutral décor. Each room has its own private terrace or balcony, with the deluxe rooms located in the main hotel building, and the suites and villas in a separate area just across a small road. Upgrading to the suites and villas provides guests with access to another pool, for those looking for a more exclusive escape as well as an option to enjoy á la carte breakfast on their balcony or terrace. Staying amid the hustle and bustle of the town provides many opportunities to explore the variety of restaurants and bars on your doorstep, along with the string of colourful beach shacks that line the coast. If, however, you prefer to spend time within your hotel grounds, after a fulfilling breakfast at the property’s restaurant, head to the main pool, where you can relax on a sunlounger and soak up the sunshine. The Deluxe rooms have either a balcony or terrace with a view of the swimming pool. They are decorated in a contemporary style and include a King size or twin beds. The one-bedroom Suites overlook the swimming pool and have a balcony with private dining facility. 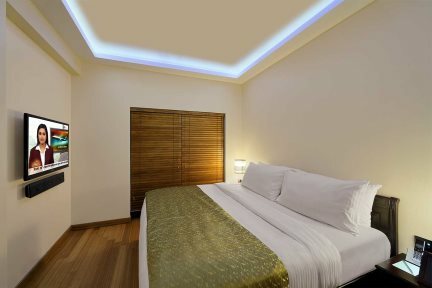 They are decorated in a contemporary style and include a King size or twin beds. They each have their own dedicated butler and enjoy an á la carte breakfast option.